RonTech MF / CoF2 Compact Friction Feeder Pharmaceutical Food Pamphlet Inserter . New Life Scientific, Inc. These pamphlet inserters can also be purchased as part of a larger cartoning and case packing packaging line that we also have listed on eBay. The RonTech model MF friction feeder is used for packaging small flat products. This stainless steel feeder was used as a pamphlet insertion device in a US pharmaceutical facility. This instrument is applicable to insert and handle different size products which may be used in the food, pharmaceutical, and cosmetic industry. Please see the product overview below from RonTech's product page. This RonTech friction feeder is is excellent cosmetic condition with minimal signs of wear on the frame and consumable belts. New Life Scientific technicians inspected the mechanical integrity and confirmed that the instrument is functional. The technicians did not power this particular piece; however, it was examined prior to acquisition in a working environment, before it was relocated the the NLS facility. This product is wired to run on 240V, but there is an installed transformer that runs on 480V; the end user may configure this system to fit their needs. This instrument was a component of a larger packaging line and the friction feeder could be added into a line using the provided control panel plug. The wiring schematics are available for review and there are two safety channels featured. The product corridor currently has one belt, but a wider or second belt can be installed. New Life Scientific acquired multiple packaging lines from a major US pharmaceutical facility whose product is now available OTC. 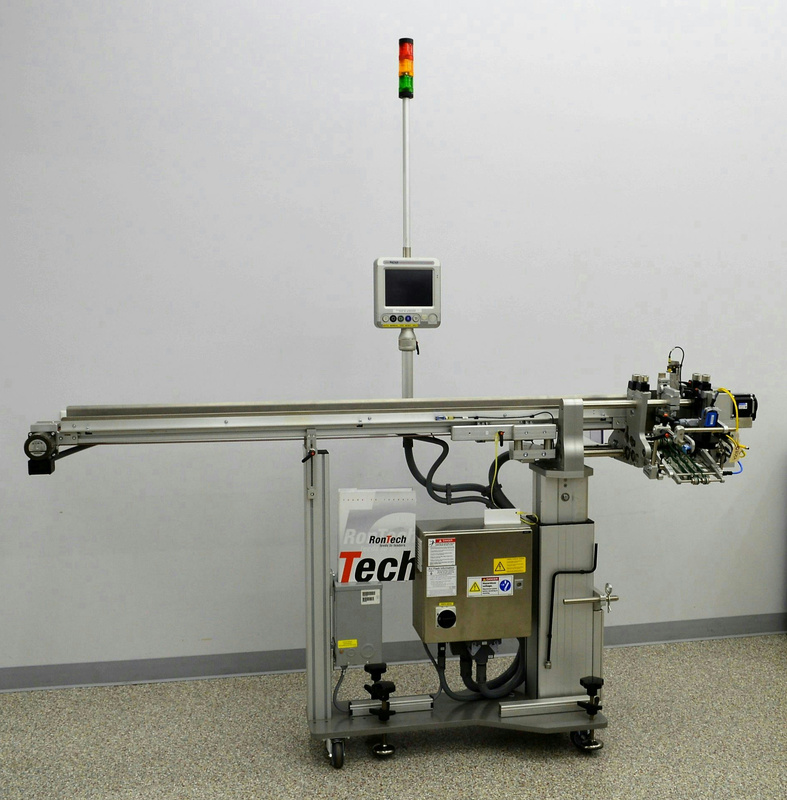 This line was used to insert pamphlets, but RonTech publications indicate that it is capable of manipulating flat objects of specified weight and dimensions for additional packaging applications. Please view additional packaging lines in the webstore or contact New Life Scientific for details and pricing. Both of these inserters were manufactured in 2013.